Ty left a bunch of great bird nest supplies supplies behind. Just check it out! We've got the produce bag webbed netting, some snazzy yarns, threads, and ribbon, and a pair of scissors. All right! Mama Dove is about to get an upgrade! Let's begin by cutting pieces of yarn and ribbon into...oh...say...five inch pieces long. (Wow...Ty even left a roll of some glimmering gold lame'. Oooo, la la!) Go ahead. Cut a cluster of pieces. We'll make good use of them. Now all you have to do is weave a piece of yarn/ribbon into a space in the webbed netting. Simple! No need to knot it. We don't want to have to make Mama Dove work hard, do we? Just poke the end of the thread into one of the holes in the webbing, pull it through a little, and let the thread hang loosely in the net. Go on...use all of the colors. Fill your net with colorful nest making options. When you're finished, simply tie your netted bag to a tree limb. That's all you have to do. All Mama Dove needs to do is grab one of these gorgeous threads in her sweet little beak and tug. 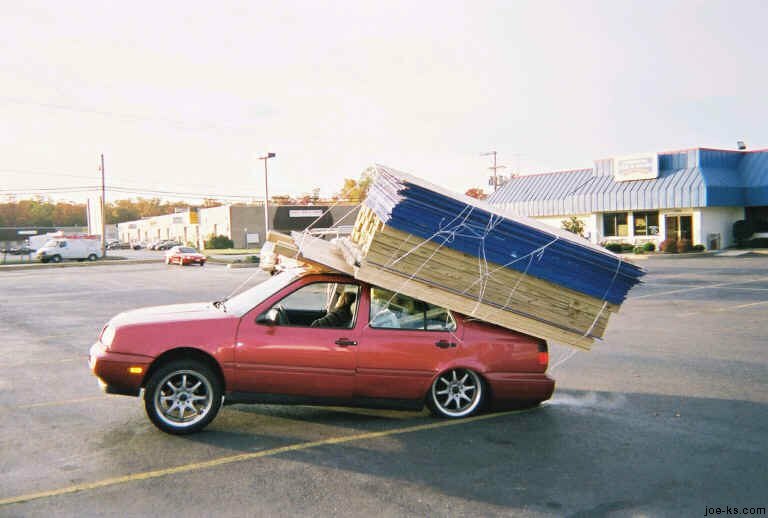 That's easier than any trip to Home Depot! Are you ready for the reveal? Since we don't have a bus, a bright red umbrella will have to do. Oh...where did I put that blow horn? Ahhh! Can you hear those doves cheering?